DUG Insight User ManualFrequently Asked QuestionsFrequently Asked Questions LicensingWhy did my online activation fail? Online activation requires an active internet connection. If the online activation fails, your computer has either lost its connection to the network, or it requires a proxy to contact our licence servers. First of all, check that your device is connected to the internet. If it is offline, connect to a network that has an active internet connection. At the prompt, or from the Help menu, select Licence Manager. From the Licence Manager, click on Network Settings. Alternatively, if you have received an error message telling you that the application is locked, select Configure Network. 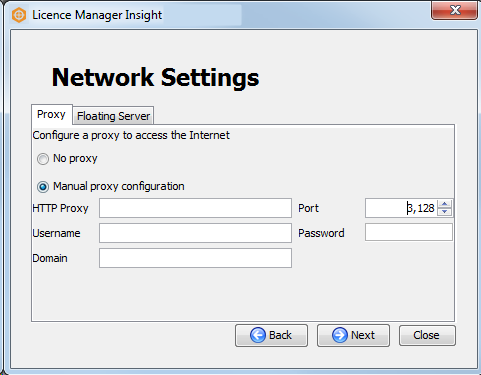 In the Proxy tab of the Network Settings window, select Manual proxy configuration. Depending on your system, you may not need to fill all the fields. Note: If you are unsure about how to configure your proxy settings, please consult your IT department, or look in the connection settings of a web browser like Internet Explorer or Firefox. Alternatively, see Email Activation to activate your licence offline. Prev: How do I activate floating licence for multiple users? Next: How can I see who is using the floating licences?